The Outback is the vast, remote, arid area of Australia; the term colloquially can refer to any land outside the main urban areas. 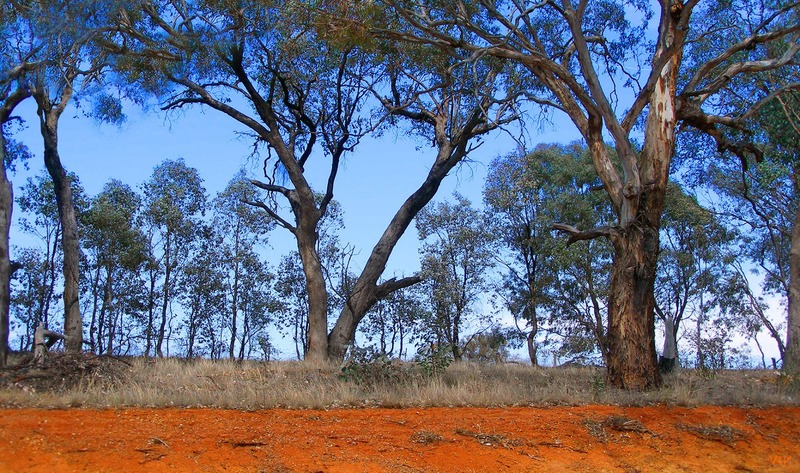 The term "the outback" is generally used to refer to locations that are comparatively more remote than those areas named "the bush". The skies tend to be blue and the soil red in these outback locations and the photo below shows a particularly lush part of "the bush" as relatively much vegetation can be seen. and also part of the Blue Monday meme. Gorgeous contrasts in this photo. So good to see what it looks like through your lens. When I visited Australia many years ago, my friends had made so many plans for travel in Queensland that I didn't get to the Outback, no matter how hard I tried to juggle our schedule. I'm unlikely to return to Australia now, and wish I had done so 20 years ago, when I could move around a whole lot faster! love the colour of the soil.